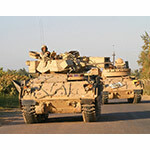 WASHINGTON & CLEVELAND--(BUSINESS WIRE)--Alcoa (NYSE:AA), a global leader in lightweight, high-performance metals, has produced the world’s largest single-piece forged aluminum hull for combat vehicles to improve troop protection as part of a joint Alcoa-US Army initiative launched last year. Announced in Washington, DC at the Association of the US Army Annual Meeting—the largest landpower expo in North America—Alcoa manufactured the single-piece part, which was co-designed by Alcoa and the US Army Research Laboratory, with the goal of replacing today’s assembled hulls. Based on early modeling and simulation, single-piece underbody structures could provide two times better protection against blasts—such as those caused by Improvised Explosive Devices (IEDs)—than traditional hulls, primarily by eliminating welded seams. In addition to survivability benefits, single-piece hulls can be optimized to reduce vehicle weight and assembly time, and, therefore, overall cost. The Army is now blast testing the hull to demonstrate its durability. After successful testing, this initiative would open up numerous opportunities for the military to apply single-piece structures to large combat vehicles and other applications. The hull is part of the Army’s Affordable Protection from Objective Threats Manufacturing Technology (ManTech) program, created to improve the military’s defense against modern-day threats such as IEDs, using affordable, advanced manufacturing technologies. Since launching the cooperative effort last year, Alcoa Defense and the Army’s Research, Development and Engineering Command’s (RDECOM) Army Research Laboratory have coordinated research and development efforts to refine the hull design and develop the alloy requirements. Alcoa produced two demonstrator forgings at its plant in Cleveland using its 50,000-ton forging press, the world’s most advanced hydraulic press. Alcoa’s engineers in Cleveland leveraged their expertise and decades of commercial forging experience to produce the hull earlier than the expected deliverable of 18 months. Stronger solid structure: A single-piece hull would eliminate welded seams used in today’s manufacturing processes, covering the entire lower section of any combat vehicle. Efficient design: Forging hulls as one unit facilitates three-dimensional shaping, allowing Alcoa to tailor the thickness where needed to maximize protection and allow for weight savings. Cost savings: The structure is expected to reduce costs over the life of the vehicle by increasing fuel efficiency through lightweighting and eliminating assembly time and complexity. Editor’s Note: Caption for accompanying photo: Alcoa has manufactured the world’s largest single-piece forged aluminum hull for combat vehicles, such as those shown here, to improve troop protection as part of a joint Alcoa-US Army initiative (US Army photo). Additional resources: Go to http://www.alcoa.com/defense for more information, photos and b-roll. The U.S. Army Research Laboratory is part of the U.S. Army Research, Development and Engineering Command (RDECOM), which has the mission to develop technology and engineering solutions for America's Soldiers. RDECOM is a major subordinate command of the U.S. Army Materiel Command. 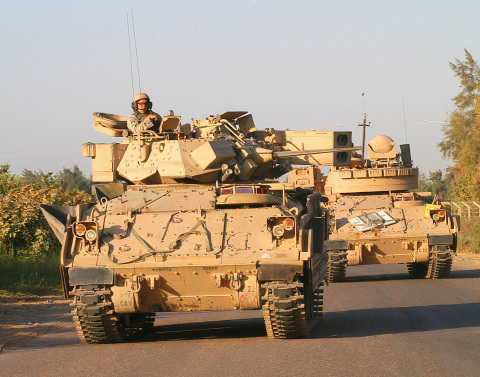 AMC is the Army's premier provider of materiel readiness -- technology, acquisition support, materiel development, logistics power projection, and sustainment -- to the total force, across the spectrum of joint military operations. If a Soldier shoots it, drives it, flies it, wears it, eats it or communicates with it, AMC delivers it. For more information, visit www.arl.army.mil, follow @ArmyResearchLab on Twitter and follow the lab on Facebook at https://www.facebook.com/ArmyResearchLaboratory. This release contains statements that relate to future events and expectations and as such constitute forward-looking statements within the meaning of the Private Securities Litigation Reform Act of 1995. Forward-looking statements include those containing such words as “estimates,” “expects,” “should,” “may,” “will,” “would,” or other words of similar meaning. All statements that reflect Alcoa’s expectations, assumptions or projections about the future other than statements of historical fact are forward-looking statements, including, without limitation, statements regarding the potential benefits of large, single-piece aluminum hulls for combat vehicles. Forward-looking statements are subject to a number of known and unknown risks, uncertainties, and other factors and are not guarantees of future performance. Important factors that could cause actual results to differ materially from those expressed or implied in the forward-looking statements include: (a) unfavorable changes in the markets served by Alcoa, including the defense market; (b) failure to successfully implement, or to realize expected benefits from, new or innovative technologies, materials, forging or other processes, equipment, or products, in each case as expected or within the time periods anticipated; (c) the risk that single-piece aluminum hulls may not meet durability testing or other performance requirements, or achieve weight or cost savings, as expected; and (d) the other risk factors discussed in Alcoa’s Form 10-K for the year ended December 31, 2013, Forms 10-Q for the quarters ended March 31, 2014 and June 30, 2014, and other reports filed with the Securities and Exchange Commission. Alcoa disclaims any intention or obligation to update publicly any forward-looking statements, whether in response to new information, future events or otherwise, except as required by applicable law. Alcoa has manufactured the world's largest single-piece forged aluminum hull for combat vehicles, such as those shown here, to improve troop protection as part of a joint Alcoa-US Army initiative (Photo: US Army).